We knew that Texas was friendly to rainwater harvesting. We knew the love extended to Taxes (there is no Sales Tax on rainwater harvesting equipment). But we had no idea our systems could also potentially save Texas landowners money on their property taxes. The "wildlife exemption" as it is commonly called in Texas, allows a qualifying Texas landowner to have their property valued at the low agricultural tax rate without traditional farming or ranching activities taking place on the property. The exemption is mainly targeted at owners of agricultural land that no longer use the land for such purposes. Landowners with a wildlife exemption pay the same property taxes they paid when their property had only an agricultural tax exemption. To obtain the wildlife exemption, the landowner must prove that they have developed a habitat conducive to wildlife. One of the key aspects of that habitat is supplemental water supplies. In other words, the State wants to make sure the landowner is providing enough water to the widlife that make the property their home. This is in addition to any natural sources. If the landowner is lucky, they already have a well and a water distribution mechanism in place. But if that well is dry due to drought or the landowner doesn't have the thousands of dollars neceessary to drill one, the only option may be a widlife centric rainwater harvesting system, also known as a rainwater guzzler. Traditional Guzzlers aren't cheap (usually over $1000) or easy to make (days to construct). But there is no reason why one of our systems can't serve the same functions at a fraction of the cost and time. 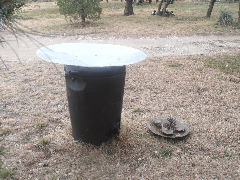 As shown in the picture from a customer in Texas, all you need is a RainSaucer, a rain barrel, and some form of drip emitter that feeds into a pan. The entire setup can be done in minutes. We have several Texas customers now using our system for birds and small game.